Pop star Prince has revealed for the first time that he was “born epileptic” and how his parents struggled to cope with his seizures. 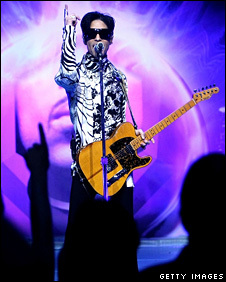 The 50-year-old gave a rare interview to US talk show host Tavis Smiley to promote his latest three-disc album. “My mother and father didn’t know what to do or how to handle it but they did the best they could with what little they had,” he said. The Purple Rain star also revealed he was “teased a lot” at school. He recalled how as a child he believed divine intervention had helped him overcome the illness. “My mother told me one day I walked in to her and said, ‘Mum, I’m not going to be sick anymore’. He also revealed that before the seizures stopped he tried to “compensate” for the illness by being “as noisy as I could and be as flashy as I could”. In the CD booklet, the word “true” was printed in mirror writing next to this line. About a third of childhood epilepsies disappear at adulthood, according to Epilepsy Action. During the interview the star also talked about his strained relationship with his father and how he was forced to keep his piano playing a secret from him. “I wasn’t allowed to play it when he was there because I wasn’t as good as him.